The Samsung SMT- i5210 IP handset is a great choice for IP requirements. Most companies will never deploy, nor justify the expense, of colour touch screens or multimedia applications on many IP phones. The Samsung SMT- i5210 IP handset is a great choice for IP requirements. Most companies will never deploy, nor justify the expense, of colour touch screens or multimedia applications on many IP phones. Top of the line IP handsets look awesome but aren't required in 90% of customers deployments (irrespective of brand). The SMT- i5210 IP handset has been designed as your day-to-day workhorse and is a good standard IP phone option. If you look at the comparison between the different Samsung SMT-i5000 IP phone series (bottom of the page) you miss very little on this standard handset. The screen size is the same as the next 2 models up (SMT-i5220 and SMT-i5230) as is most of the functionality. What you don't get is the unified communications functionality (such as Presence, Scheduler, Instant Messaging and Video), 10 less programmable buttons and one less soft key. It offers 2 ports for 10/100MB Ethernet connection however this is the only model that cannot attach the optional Gigabit adaptor should you require it. For many users these additional features are irrelevant. The Samsung SMT- i5210 IP handset offers users 14 programmable buttons that are configured in a traditional pbx handset style. These buttons can be customised to display not only phone lines and staff but also system functions. Next to the 14 programmable keys there are busy light indictors than offer 3 different colours to distinguish whether users are busy, free or in a meeting on DND (Do not disturb). If you program a button for a function, the LED indicator will change to show if the feature is active or not. If you want to see more than 14 staff at a glance you can either upgrade to the Samsung SMT-i5220 IP handset or choose to attach the add on module (AOM) (optional SMT-i5264 DSS console) which has a further 64 programmable buttons also with LED indicator lights. If you don't need to see 14 staff and don't need the option of gigabit connectivity in your environment then you should also check out the cheaper Samsung SMT- i3105 and SMT- i3100 IP handset models. With the OfficeServ IP Pbx system you can mix and match from any of the available IP or digital phones. This allows you to work out the right mix for your staff as well as your budget. If your office already has 2 points cabled to each desk from previous phone systems then phone handsets are a great way to significantly reduce implementation costs. If you're checking out cheaper digital options then you should consider the DS-5007S phone or the slightly better Samsung DS-5014D phone handset. The Samsung SMT-i5210 VoIP phone offers 3 context sensitive soft keys below the screen as opposed to 4 and 5 on the more expensive models. Context keys are buttons that present the most logical on screen options that change depending on what task you are performing. This makes using modern IP phones much easier as you don't have to navigate around the handset to look for the option you're after. For viewing the optional SMT-i5210 offer users the choice of either a 30 degree or 60 degree option if you prefer a more upright angle. If you choose to wall mount the handset you can also buy an optional bracket which is great for kitchens, warehouses and the like. As the features are basically the same from higher models, the optional SMT-i5210 phone also comes with handset, microphone and speaker wideband audio with G.722 wideband Codec. To an end user this simply means that the quality of your VoIP calls is superior and delivers a natural sound. As an aside, if you're looking to attach a headset to the jack on the phone it is always a good idea to ensure that the headset is equipped with wideband audio too if you're using it with a softphone as well as the handset. Like all Samsung SMT 5000 IP phone series there is also a jog dial button in the middle SMT-i5210 VoIP handset. Most IP handsets have gone down this path because it makes accessing the handset and system features like directories much easier. The SMT 5210 has physically separated phone call keys from the other phone feature controls located near the jog dial. Everything they need is blocked together so you'll easily locate the volume, keypad, mute etc near each other. It's only a small thing but it's good. Like most IP phones, the SMT- i5210 VoIP phone is plug and play whether you are in the office or at a remote location. The only caveat is that the Ethernet port is live and programmed to the system. This means you can move desks and simply plug your handset in and login. With that it automatically brings all your customised presents, extension number and programming with it. This is a departure from traditional phone handsets that required technicians or administrators to reprogram the extension to the handset. If you have an environment that involves hot desking where staff use any available phone, they can now login with their own extension and carry forward all their personalised settings to the SMT- i5210 VoIP phone. The SMT-i5210 also comes with 2 Ethernet ports (both 10/100MB) so you can use the one port for both your office phone and your PC. 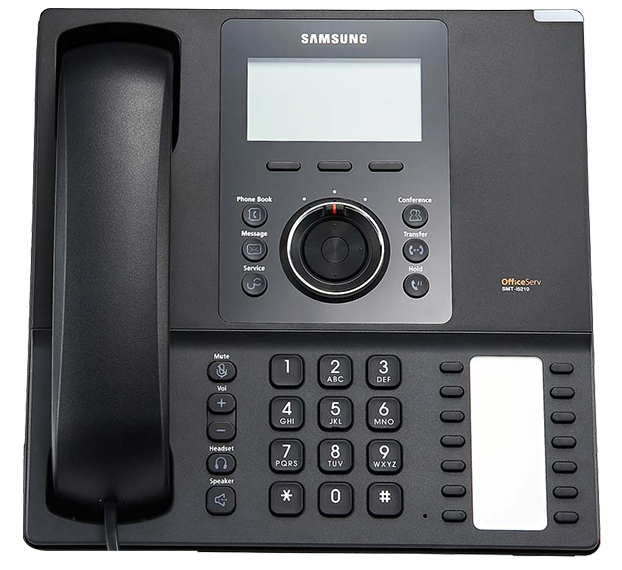 If you're specifically after a larger colour screen for multimedia applications then the Samsung SMT-i5243 IP phone handset is the only choice in the current Samsung IP range. Realistically the only real drawback to the SMT- i5210 VoIP phone is the lack of Gigabit connectivity. The rest of the features seem to fall into the nice to have for most potential customers and this really is a good IP phone for what you get. Looking to learn more about Samsung SMT-i5210 IP Phone Handset?